PLANET in PERIL, your "one-stop shop" for the truth about our planetary crisis. : Sowing Seeds of Misinformation: Let’s Set the Record Straight on GMO Crops and Foods! 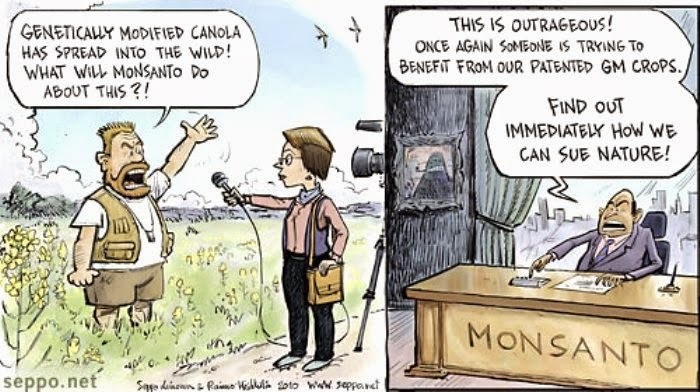 Sowing Seeds of Misinformation: Let’s Set the Record Straight on GMO Crops and Foods! Two Canadian citizens’ respond to the pro-GMO propaganda of American Professor, Dr Kevin Folta, while lecturing in Winnipeg during late October 2014. We are two Canadians, one a hobby organic farmer (RS), the other a retired university professor (JB). We are deeply concerned about the impacts GMO crops have on human and environmental health. In fact, that concern is what brought us to meet on the web. And if that concern makes us into “ACTIVISTS”, so be it. At least we care about people and environmental health. The same cannot be said of the corporate transnational agri-giant cartels, the producers and promoters of GMOs, with their so-called “gifts of “modern agriculture”. You can not grow healthy foods with poison! This simply is not true—on the contrary: this is the misinformation. What Folta conveniently forgot to mention in his remarks is the fact that GMO crops are laced with agro-poison residues (peddled to unsuspecting farmers as Herbicides/pesticides). It is true that these chemicals kill weeds and insects, thus making agriculture more convenient. But they also kill honey bees, and harm human health very significantly, especially over the long run. Sadly and unfortunately, GMO crops, largely sprayed with these chemicals and foods which contain varying traces of these toxins/poisons are not required to be tested for residues by Health Canada and/or independent laboratories. Health Canada simply accepts unverified confirmations on safety supplied to them by the GMO crop giants, and their downstream customer food processors. That casual approach to presumed safety use by Health Canada may soon be regretted. This, especially when the class action lawsuits commence charging liability and responsibility for harm to human and environmental health. The recently initiated $400-million lawsuit by Ontario ’s beekeepers against Syngenta and Bayer CropScience is an indication of what is to come. The proverbial “Tip of The Iceberg”. These folks are not some misguided anti-GMO “activists”, spreading fear and propaganda. Consequently, the EU and up to 64 countries world-wide have banned or introduced mandatory labeling of GMO foods for some time now. In Canada and the US , on the other hand, even that simple step---mandatory labeling---was & is prevented by the powerful pro-GMO lobby. 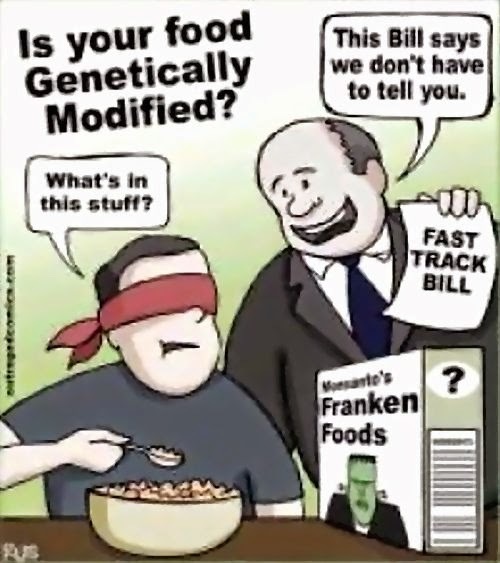 For example, in the US the bio-tech giants and their corporate friends have spent over $200-Million during the last few years to fight mandatory labeling initiatives. Canada , of course, follows the retrogressive “lead” of the US ; perhaps because of the “shackles” of NAFTA? It is now time, even urgent that all people in Canada rally and demand that Canada ratify the UN convention on biodiversity preservation (Cartagena Protocol), which should make it difficult for foreign corporations to steal, harm or make extinct, Canada's biological diversity. The 11th hour is upon us. Better to initiate the “Precautionary Principle” and ban the use of all poisons used in commercial agriculture today and resort to the tried and true practices of chemical-free organic farming. Our and the planet’s survival depends on it!